On February 22, the fourth day of the first month of the lunar Year of the Sheep, with red lanterns hanging high and colored flags fluttering in the wind, Trafalgar Square was filled with people. 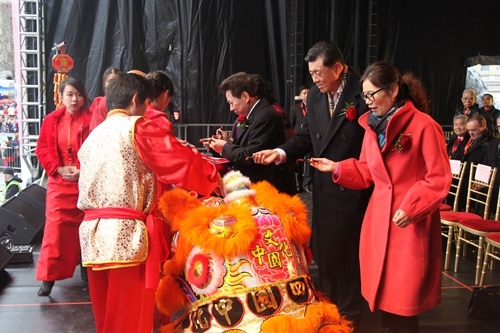 British citizens and tourists from all over the world came together, braving wind and rain, for a Chinese New Year celebration co-sponsored by the Greater London Authority, the Westminster City Council and the London China Town Chinese Association. Qiu Yuanping, Director of Overseas Chinese Affairs Office of the State Council; H.E. Ambassador Liu Xiaoming and his wife Madame Hu Pinghua; Stephen Greenhalgh, Deputy Mayor of Greater London; Audrey Lewis, Lord Mayor of Westminster; Mr. Chu Ting Tang, Chairman of London China Town Chinese Association and British MP Mark Field attended and addressed the opening of the celebration. 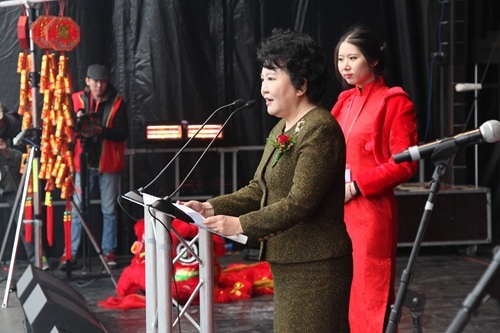 On behalf of Overseas Chinese Affairs Office of the State Council and the "Cultures of China, Festival of Spring" art troupe, Madame Qiu Yuanping extended best wishes and greetings for the Chinese New Year to the Chinese communities in the UK and to friends from all walks of life. She said, "The Spring Festival has gone global. It not only spreads the festive atmosphere to overseas Chinese, but also brings the good wishes of the Chinese people to the whole world. 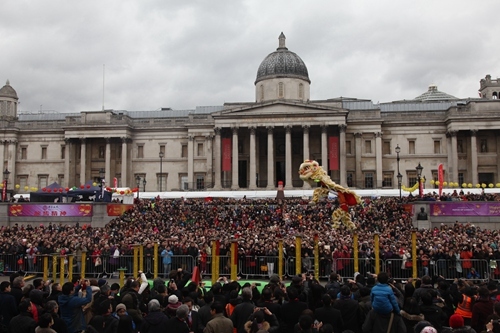 'Cultures of China, Festival of Spring' has been at the Trafalgar Square celebration for seven consecutive years. Today, hundreds of thousands of Chinese and British people as well as tourists from the world gather here to share the joy of the Chinese Spring Festival. Taking advantage of the "UK-China Year of Cultural Exchange", we aim to present overseas Chinese and British citizens a wonderful performance that bears Chinese national features. Through the performance, all of us can enjoy the beauty of Chinese songs and dances and experience the unique charm of Chinese culture, and spend an unforgettable afternoon." H.E. 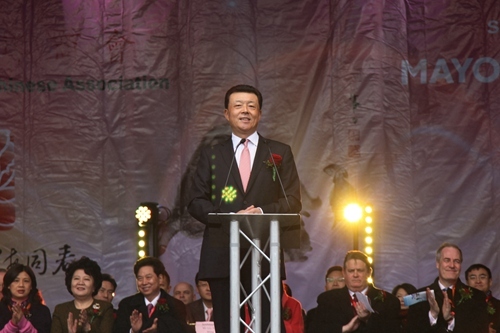 Ambassador Liu Xiaoming said, "I am truly delighted to once again join you here at Trafalgar Square to celebrate the Chinese New Year. We celebrate the Spring Festival because it is the time to bid farewell to cold winter and welcome warm spring. The parks here in London as well as your gardens back home will soon be in full bloom and brimming with life. We celebrate the Spring Festival because it is a happy and joyous occasion. We give each other our best wishes, and we hope for happiness and good luck in the coming year. We celebrate the Spring Festival because it is a synonym of family reunion and bonds with loved ones. It is a symbol of traditional family value of the Chinese people. For every Chinese on the road, Spring Festival is the time to be home. Ambassador Liu said, "In the Chinese culture, the sheep symbolizes safety, health, harmony and satisfaction. So in this Year of the Sheep, I wish for peace and tranquility in the world, happiness and safety for people of every country, continued progress of China-UK relations, and good health, harmony and satisfaction for each and every one present today." British Prime Minister David Cameron sent a congratulatory letter to the event and the Mayor of the Greater London Authority Boris Johnson sent a congratulatory video, in which they extended their greetings to all the participants and audience, expressing their hope for further development of China-UK relations. Deputy Mayor Greenhalgh and other guests spoke highly of China and its fast development, and wished China-UK relations fresh progress. They expressed best wishes for Chinese New Year and delivered in Chinese the New Year's greetings to all members of the Chinese communities in London and in the UK. At 1 p.m., accompanied by the beating of gongs and drums, Director Qiu, H.E. Ambassador Liu, Deputy Mayor Greenhalph and other guests followed the Chinese traditions and painted the eyes for the dancing lions. After the festive dragon and lion dance, "Cultures of China, Festival of Spring", "Happy Spring Festival" art troupes and British artists presented a wonderful performance for the audience. The opening dance, Flower-drum of the Spring Festival, depicted a scene of people celebrating the festival and charged the atmosphere with excitement. Echo in the Valle and Carp Leaping into the Dragon's Gate that followed were rich in Chinese tradition and loved by the audience that moved to the music. Face Changing from Sichuan opera, noted for its swift change of masks and a distinct sense of humor, received warm responses from the audience. The stunning dance Thousand-Hand Kwan-yin expressed endless vitality and a feeling of harmony and happiness. This was followed by Zen and Martial Arts, a piece that combined the Zen culture with Chinese kung fu. The glamour of Chinese martial arts was greeted with loud cheers from the audience. The fantastic performance was a unique audio-visual feast that displayed the significance of "The China Dream" and conveyed friendship as well as good wishes. The performance lasted from noon to evening. Happy dances, beautiful music and songs, colorful costumes and the joyous atmosphere attracted a great number of people. H.E. Ambassador Liu Xiaoming gave a live interview to Chinese and foreign media, including CCTV, Xinhua News Agency, London Evening Standard, Nouvelles d'Europe, Sing Tao Daily, Phoenix TV and Propeller TV. Ambassador Liu answered questions about China-UK relations, China's Spring Festival and traditional culture, the political role of the Chinese community in the UK and the development of Chinese community organizations. 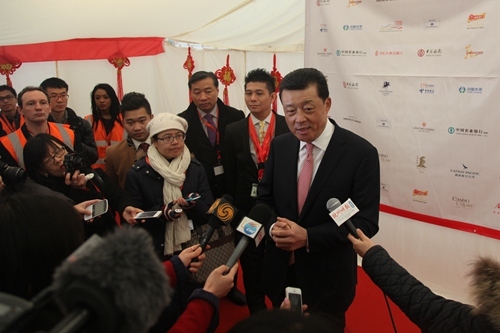 He also extended Chinese New Year greetings through the media to all the overseas Chinese in the UK.